I am a bit of a technophobe. I like gadgets so I am certainly not against using technology past, present and future in the church but from time to time we all just need to be reminded on the basics. In the above verse as Jesus sends out His followers on mission he reminded them that THEY were the method he would use to make a difference in the world. 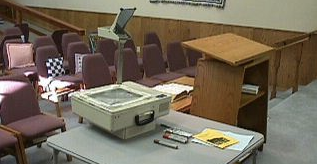 Hymn Books, a Hammond Organ, PA System but only for the voice, in Sunday School the flannel graph but really there was not much more. We had an accordion and portable speakers that looked like 2 metal bowls stuck together for our open airs. But that was it until the Over Head Projector made an appearance. That was my ministry for a while, putting the acetates on the screen, the RIGHT way up, then to move the verses up to the top as we sang them. However we could only use it in our "Gospel" service not the breaking of bread service and then only for "Choruses" and not Hymns, for them we used the books. Strange I know but on the other hand equipment really was not that important as I remember it. We didn't have discussions about what we NEEDED to do church because there was not much TO need we just did it. What we did need then and we do need now is for God to show up. The best thing about that is that is "free" and is available the same to a church meeting in a mud hut in Africa with zero equipment as it is to multi million pound state of the art auditorium seating 20,000 people with all the bells and whistles.